For a while now, I have been noticing an increase in the instances of kitten owners not taking their kitten in for its 16th week vaccination. Not only are kitten owners not getting this crucial vaccination for their kitten, but there seems to be a few breeders out there that are also not properly vaccinating their kittens even if they do not allow their kittens to go to their new homes until 16 weeks of age or older. I know of a few people recently that got kittens from reputable breeders, who like me, believe we are over-vaccinating our cats and kittens. However, what they are missing (or not understanding) is that the most import and crucial vaccination is at 16 weeks of age. 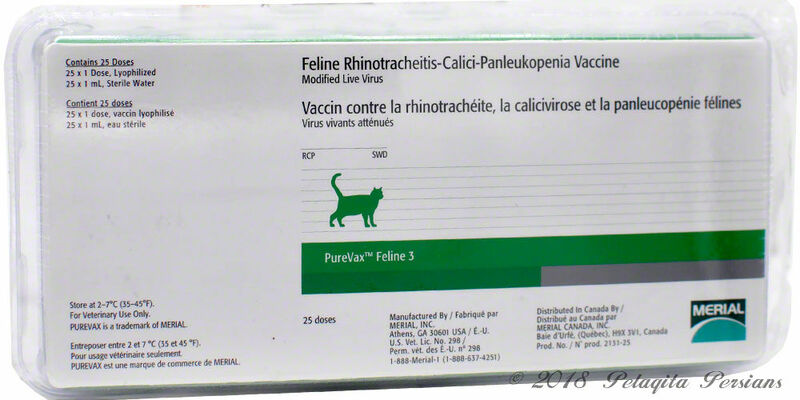 Giving the kitten its vaccinations at eight and 12 weeks of age and then skipping the 16-week vaccination means the kitten is NOT PROPERLY VACCINATED. Not being properly vaccinated means the kitten is in danger of becoming sick with the very illnesses we are vaccinating for. I know I sound like an old record going over and over the same thing, but if you have not already done so, please read the excellent and thoroughly researched article by a feline veterinarian about the PROPER way to vaccinate kittens. This article also contains information about what CORE vaccines are, when to vaccinate and how often to vaccinate and so much more information. I encourage everyone to read her article "Vaccines for Cats: We Need to Stop Over-Vaccinating."